The Energy Transition Lab (ETL) received a gift of $50,000 from Connexus Energy to fund research examining solar sites in Minnesota designed to also benefit pollinators, such as native bees. ETL is working closely with the Natural Capital Project (NatCap) and the U.S. Department of Energy’s National Renewable Energy Laboratory (NREL) on the work. Pollinators are integral to 35% of the world’s crop production. 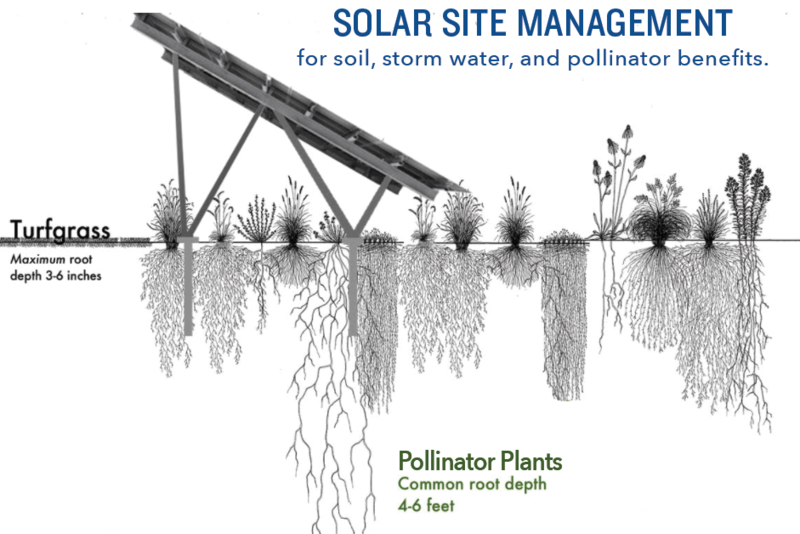 The Minnesota Department of Agriculture calls pollinators “an irreplaceable public resource.” A recent peer-reviewed study, “Examining the Potential for Agricultural Benefits from Pollinator Habitat at Solar Facilities in the United States,” identified thousands of acres of pollinator-dependent crops in Minnesota located near the 489 MW of solar arrays (as of Dec. 2017) throughout the state. As well as improved public perception of solar power resulting from more aesthetically and environmentally pleasing facilities. We’ll post more here as the project progresses.